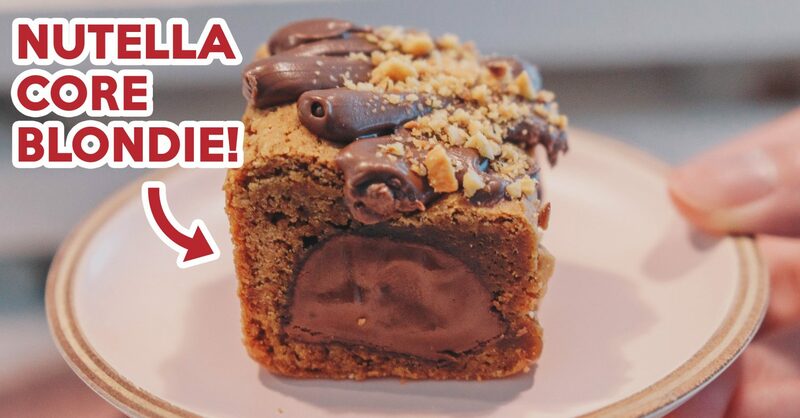 Update (5 Jan 2019): Kumoya is now hosting a Pusheen cafe pop-up. At the risk of a few “swipe-rights” on Tinder, let me just say: I.LOVE.MY.LITTLE.PONY. I remember hesitantly watching the first episode back in 2010. 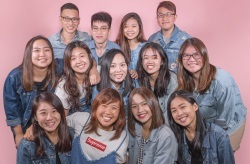 Once the credits rolled, my cynical self immediately dissipated and I was brimming with positivity, thanks to the magic of friendship. 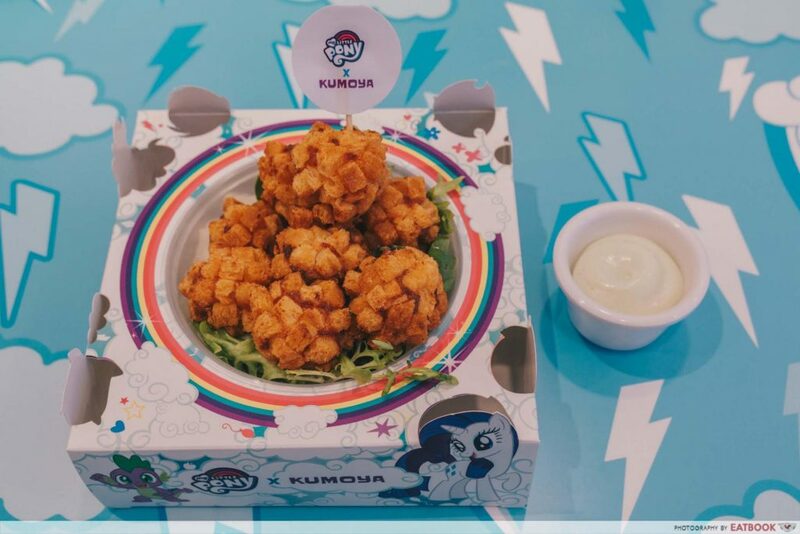 That’s why I’m beyond hyped that Kumoya is collaborating with My Little Pony for their next pop-up cafe. 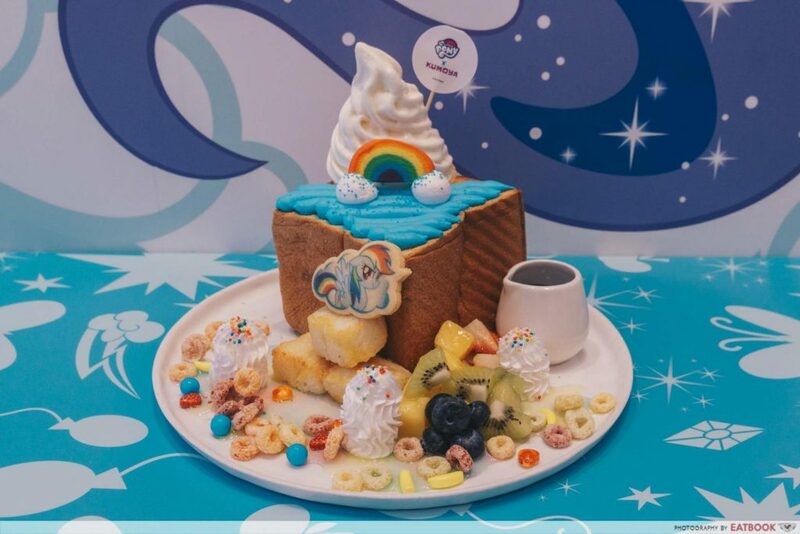 From 27 September 2018 to 30 December 2018, you can indulge in waffles, burgers and desserts – themed after the Mane Six and other ponies in Equestria. First up were the Truffle Fries ($11.90+), comprising of hand-cut fries, tossed with Parmesan and infused with truffle oil. As they were cut into wide pieces, there were more potatoes in every bite, allowing us to appreciate the fluffy centre of the fries. That said, the fries could have been more flavourful as we could barely taste the Parmesan and truffle. Thankfully, the dish was served with a truffle mayo dip which gave an earthy depth. The Shrimp Bomb with Wasabi Mayo ($12.90+) was fried beautifully and had a nice crunch to them. But the star of the dish was definitely the wasabi mayo dip, which packed a savoury flavour with a lingering sweet aftertaste. Tip: Dip the truffle fries in wasabi mayo, and the dish is elevated instantly. The combination of truffle oil and wasabi mayo made the fries extremely decadent. Moving on to the mains. 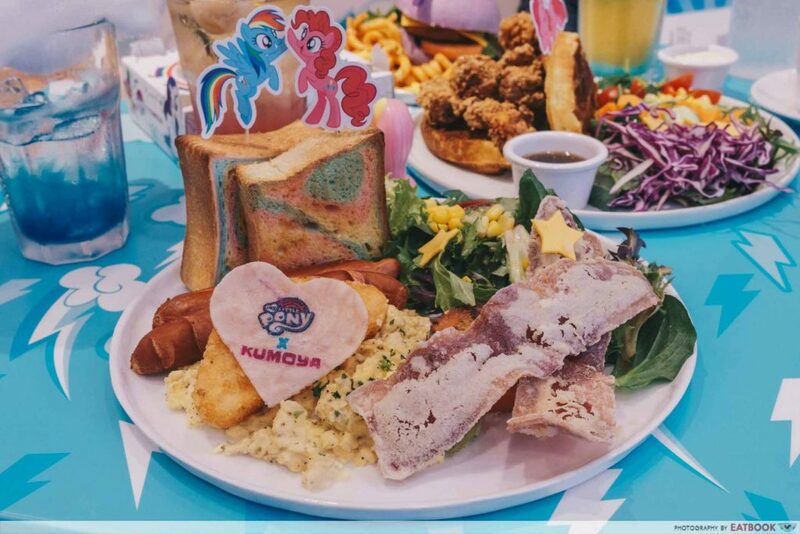 It felt almost sacrilegious to remove the cute Rainbow Dash and Pinkie Pie picks from the Magic Friendship Rainbow Big Breakfast ($24.90+), but duty calls. The mammoth dish comprises house-made rainbow bread, chicken and beef sausages, turkey bacon, chicken ham, scrambled eggs, hash browns and some greens for good measure. With a surfeit of ingredients on the plate, serving the rainbow bread as thick chunks was a good call. The bread itself was baked just right, crispy on the outside and fluffy in the centre, and had a sweet aftertaste to boot. 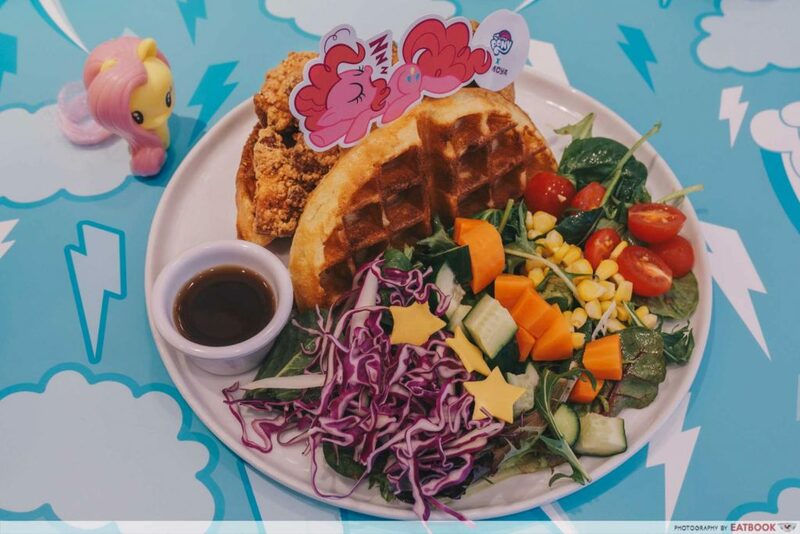 The Pinkie Pie Playful Waffles with Karaage Chicken ($23.90+) was simply amazing. The chicken bits were seasoned well and you could taste the garlic in every bite. The buttery waffles were gao and paired beautifully with the tender chicken. Dip them into the shoyu sauce for a wave of salty and sweet flavours. 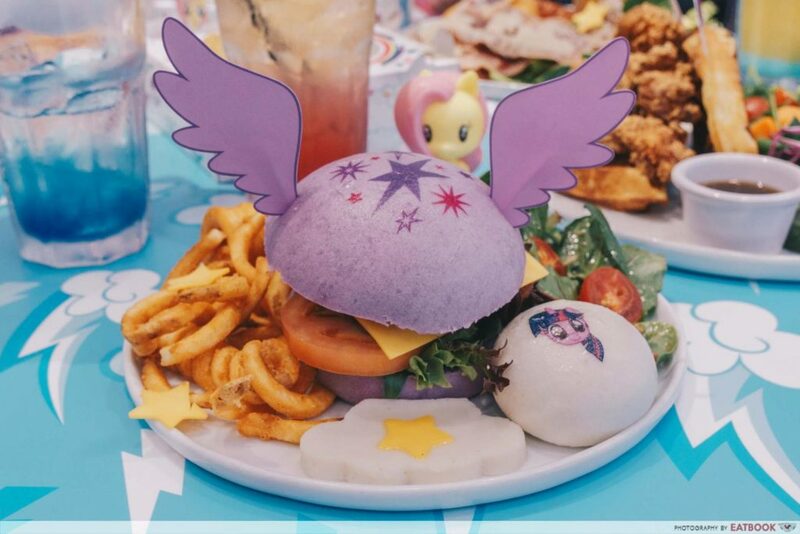 Out of the three mains we had, the Twilight Sparkle Soaring Skies Chicken Katsu Burger ($22.90+) was definitely the most aesthetically-pleasing; with wings jutting out the burger and purple buns stamped with Twilight’s cutie mark. The chicken juices were practically oozing in every bite, and blended well with the sweet teriyaki sauce. Fair warning, the buns are made from mantou so expect the burger to be more doughy than the usual ones. 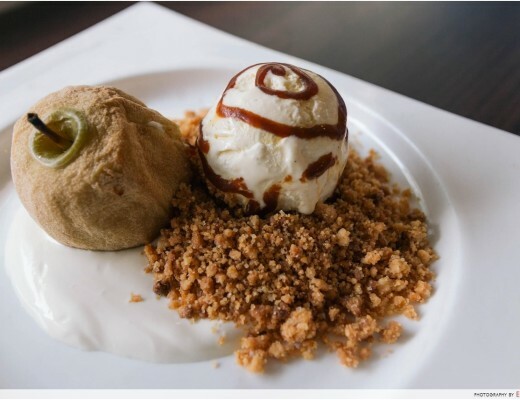 Of course, it’s not My Little Pony without desserts and luckily, they were aplenty. We knew we had to get the Magical Princesses with Magic Potion Galaxy Cake ($21.90+) as it came with a galaxy glaze ought to guarantee a bombardment of likes on Instagram. The glaze itself was thick and glittered radiantly. Taste-wise, I thought it wasn’t overly cloying and I enjoyed how fresh the mousse tasted. 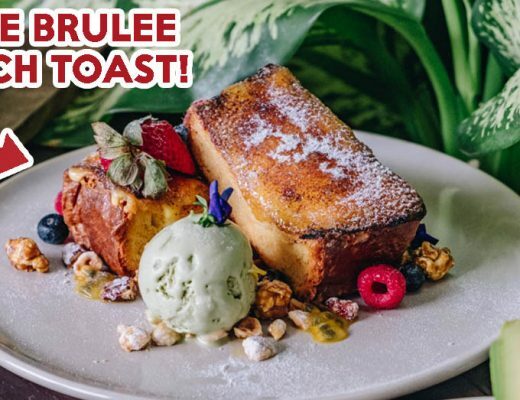 You could literally taste the rainbow with the Candylicious Rainbow Fruity Shibuya Toast ($24.90+) – a hodgepodge of sweet and sour flavours, courtesy of the ice-cream and fruits respectively. Although the toast and Hokkaido soft-serve were divine, I thought the fruits were too tart and overpowered the sweetness of the dish when eaten together. 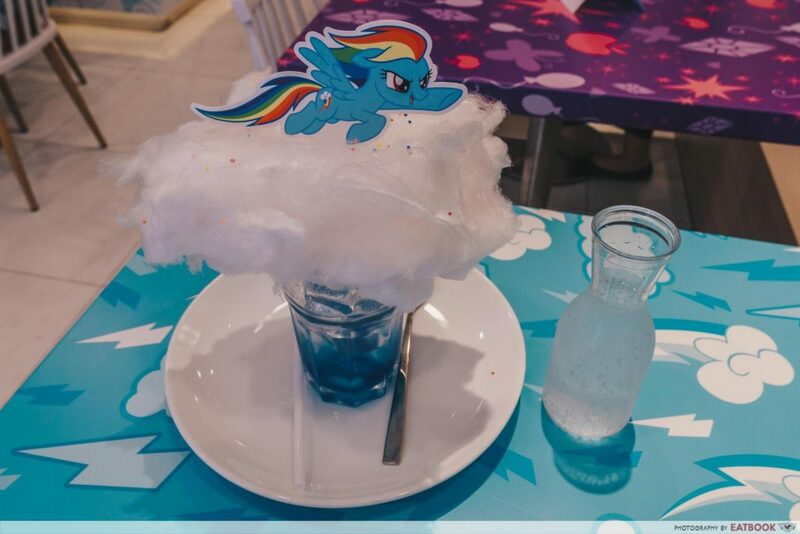 I loved the design of the Rainbow Dash Fluffy Clouds Bubblegum Soda with Fluffy Cotton Candy ($12.90+). Be sure to appreciate that cotton candy ‘cause it’ll pretty much disappear once you pour the soda into the concoction. While I liked how refreshing and sweet the drink was, I wasn’t a fan of the slight medicinal aftertaste that lingered in my mouth. 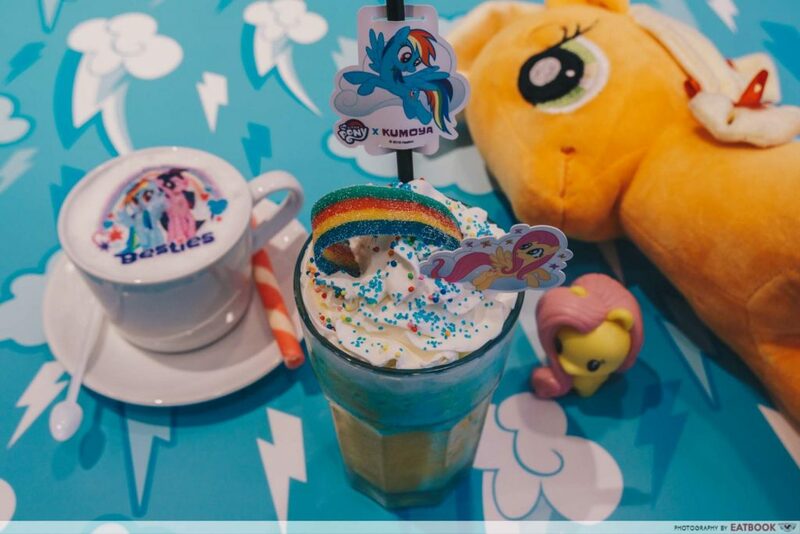 The Friendship is Magic Mango Milk Frappe with Magic Rainbow Candy Band ($13.90+) was hands down the best drink we had that day. The mango puree tasted fresh and wasn’t overly sweet. The sour rainbow band also added a neat dimension to the drink. I could sing paeans about the ambience at the cafe. 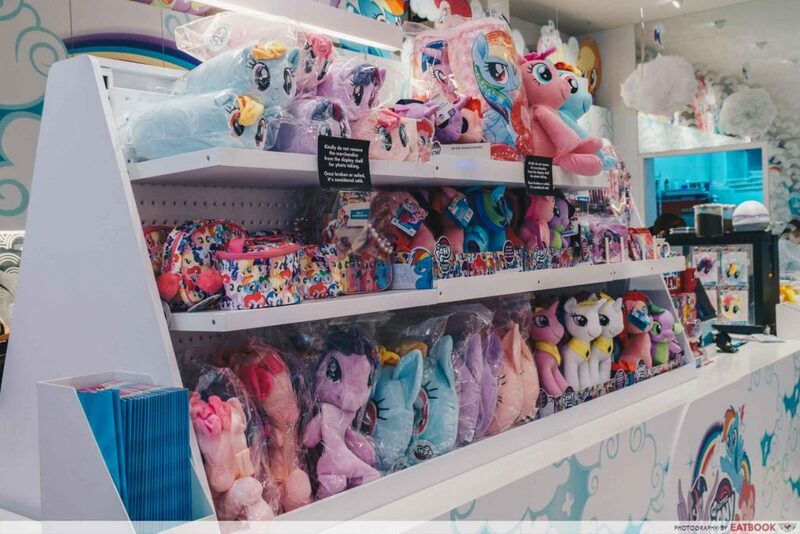 Everything here was unabashedly pony-rific, from the pony cutouts that filled the walls to the plushies that lay on every cutie-mark-wrapped table. I also appreciated how tunes from the show played in the background as we ate, adding up to the entire experience. Fans will also be glad to know that there’s a section where they can purchase various merchandise like bags and pillows. 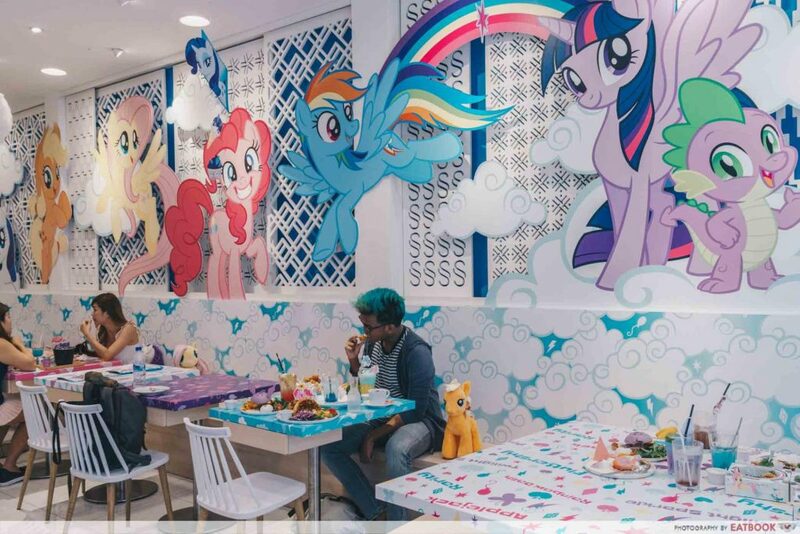 If you aren’t a fan of My Little Pony, this place will do little to convert you. While the dishes were satisfactory, they were definitely on the pricey side. 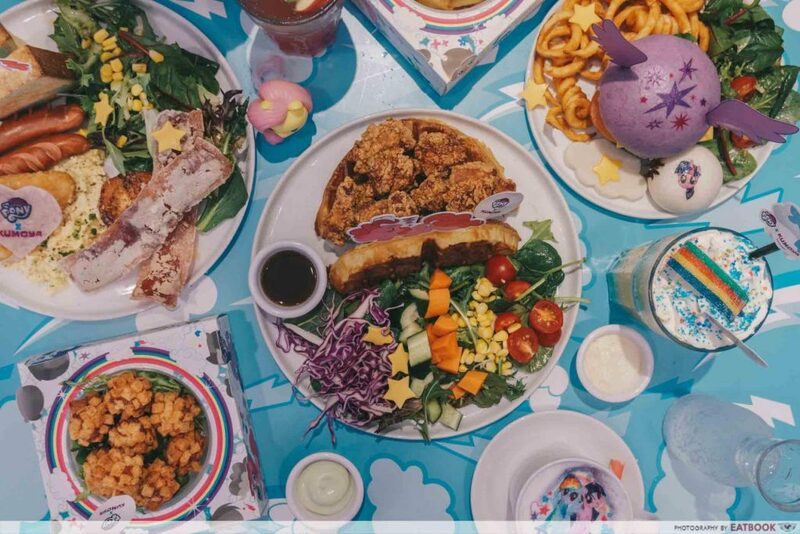 That said, as a long-time fan of the franchise, this cafe definitely hit the right notes in terms of portraying the vibe of the show through its decor and food design. 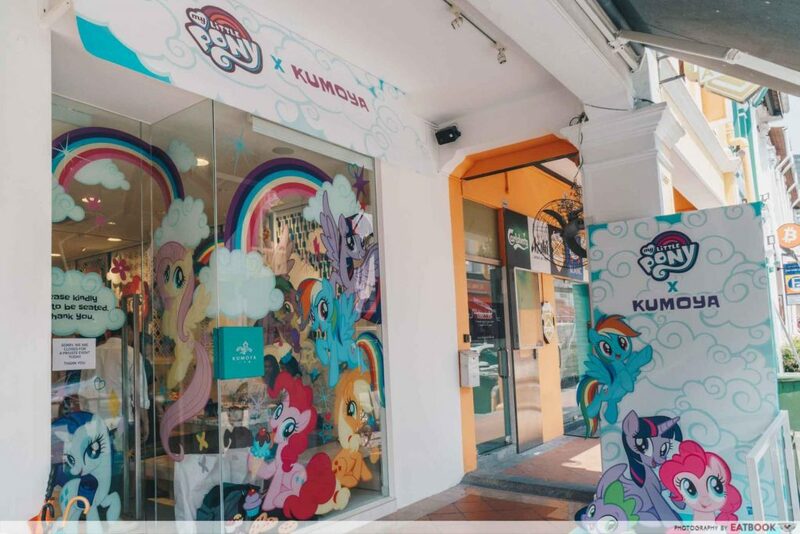 Based on those factors, I would definitely recommend My Little Pony fans to check out this unique cafe. 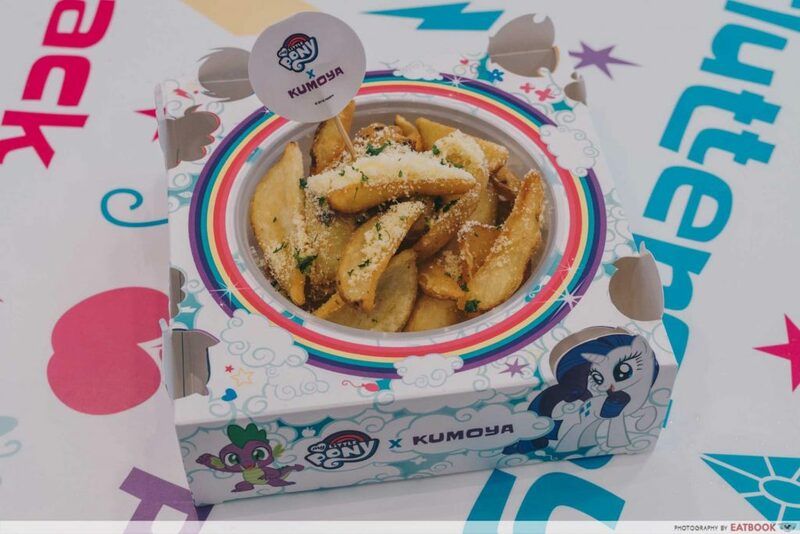 This was a media tasting at My Little Pony x Kumoya Cafe.